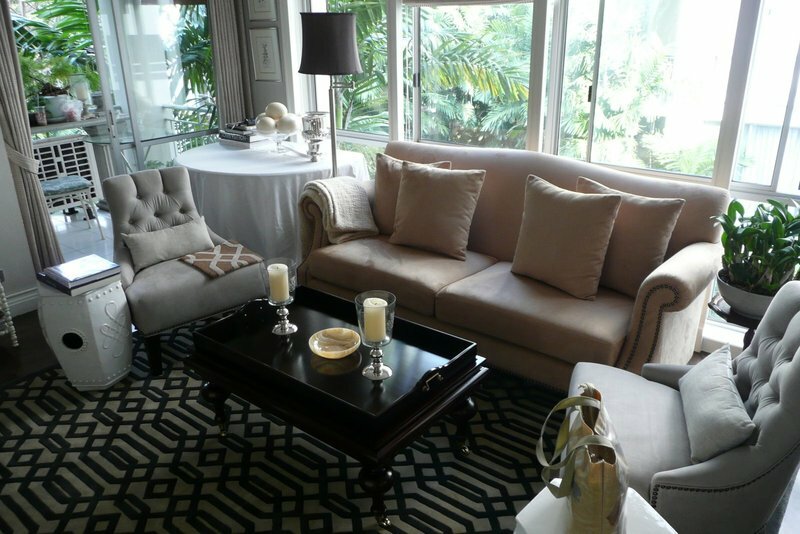 This entry was posted in Uncategorized and tagged Carpet, condo, Decorating, Furnishing by christao408. Bookmark the permalink. Haha! The video is really funny, especially with the soundtrack. I find the new space really brilliant. I love the carpet- the pattern is interesting and I love the colour scheme. It brings alive the space. I don’t see any colour disconnect between the chair and the sofa. Overall, I think it compliments each other and gives a nice contrast- especially with regard to how it balances the whole space in general without letting anything distract from the beautiful table which is the focal point of attention. If you change them to the same colour scheme, the space will end up looking dull (if you retain the couch) or uncomfortably bright (if you go with the chair). My opinion is of course based on the colours as perceived in this particular lighting for the photo, sometimes the colours are very different in reality. So, you definitely would know better. @Dezinerdreams – I see we have received the professional opinion! LOL Actually, we’ve talked about introducing a subtle pattern for the sofa. Wow…don’t let Dezinerdreams EVER see photo’s of my house…lol he would NOT be impressed!!! I like the whole new look, but I am with you, the side chairs wouldn’t be enticing to settle in and read or watch tv. I would love one of those big oversized chairs and ottomons…now THAT would be a good reading chair!!! Love the carpet.The chairs look nice too but like you said, may not be that comfortable for longer periods of time. Nice background music, sounds like a love song to me though. I like the carpet which adds some pattern to the overall living space and the color seems to resist stains too! Good choice of the chairs too. Well done! I wonder how much the whole update cost? @christao408 – LOL! Chris, am a fashion designer… not an interior designer, for all you know… what I told you might just as well be a bunch of crap! @Dezinerdreams – hahahaha… I was in awe of what you wrote. I just can’t figure out how you keep it so clean….The pattern is a bit too busy for my liking but it seems to work in that space. The colour of the curtain by the door matches it. If you want more colours in the room, use different coloured cushions, something that will pick up on the color of the carpet. One other thing, it might be a bit tight getting to the balcony door. So be careful when you’re carrying a tray of food or drinks. Overall effect is pleasing to the eye. Hope you don’t over analyze it and end up unhappy… I’m a fan of the coffee table and the rug – the lighter colors make the table stand out. 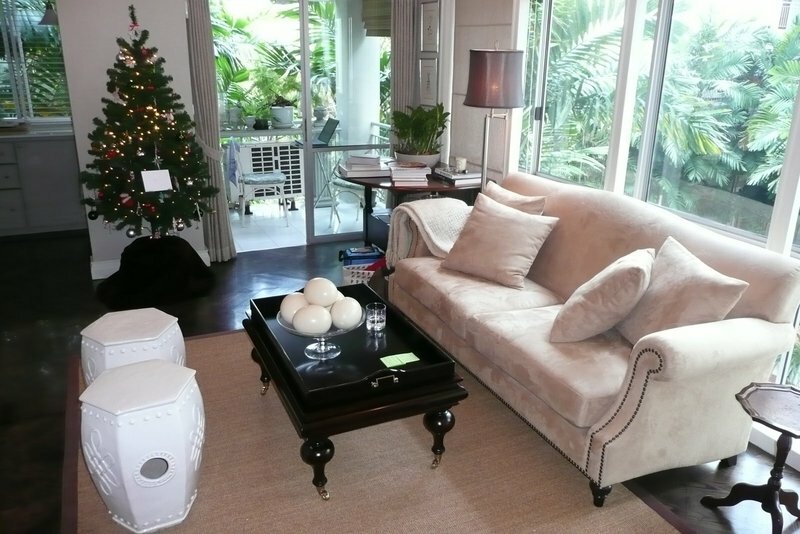 The rug definitely enhances the space … it seems more spacious than before. I love the carpet. Not hot on the chairs for the same reasons you mentioned. Not that this is new but I LOVE your coffee table!! Looks great, although I can see what you mean with the chairs. I think I’d feel very odd in that chair. My chairs have large arms and are oversized in general. Grandma and I like the chairs, although they aren’t “curling up with a good book” chairs. Several people said they liked the table. I’m not certain what you could do with it, but I think the black finish causes the table to be absorbed into the carpet, losing its distinctiveness. I do agree with Sandy that a little more space between pieces would create a more visual spaciousness. It’s so easy to have too much furniture in a space as many of us know. i liked the salmon colored carpet and the couch. The new carpet looks busy ( albeit beautiful ), and gives the room a somber and formal look. It seems to shrink the room somewhat. That’s my two cents worth. @Redlegsix – Yeah, he’s got a sharp eye but is still a nice guy. =)@CurryPuffy – Surprisingly little. We have contacts at both the carpet factory and the chair and sofa factory so bought directly from them, having everything custom designed and built without any middlemen. @yang1815 – I guess I’ll need to buy a Laz-y-boy and hide it away somewhere for my comfortable book reading! @Dezinerdreams – Oh, it might be a bunch of crap Vivek, but you delivered it with such authority! =D@ElusiveWords – Tawn goes through and compulsively tidies the space each night. I’m not allowed to have any mess in the living room. Or the bedroom. Or the dining room. Or the kitchen. That’s what the Annex is for. Kind of… As for the space by the sliding glass door, there is a bit more of it than appears in the picture. The angle is deceptive. I will be careful when setting up afternoon tea on the balcony, though, lest I spill. @murisopsis – Oh, I won’t over-analyze it. I’ll leave that to Tawn! LOL@brooklyn2028 – The coffee table is really nice, yes. Thanks for saying that. I’m sure Tawn will be happy to hear. @TheLatinObserver – Yes, it does have a good effect on the sense of space, doesn’t it? @M_1 – We’re both big hardwood floor fans but at some point there needs to be something to define the space a bit. That’s where the carpets come into play. The photo doesn’t do it justice but there’s still a ton of bare hardwood floor throughout the rest of the place. @ZSA_MD – Interesting, divergent views on the carpet. And to think I was advocating a busy Persian carpet! The color on the couch is actually tan. The picture doesn’t represent the color very accurately. @jandsschultz – The table is actually a deep walnut so in person it doesn’t appear quite as dark as it did in the picture. @jandsschultz – @stebow – I agree with both of you that a more open arrangement would be better. I’m going to push for a trial of that layout. 1000 more square feet? I’m sure Tawn could figure out what to do with it. @arenadi – I really love the large leather armchairs and “club” (as in men’s cigar club, not nightclub) look. This conflicts 100% with what Tawn was striving for so we’ll have to wait until the day when I have a ski lodge or something to decorate it fully in my taste. @christao408 – I’d totally vote for LA-Z-BOY. I think it really pulls the room together. I love the pattern! It’s really unique.